Honeywell's 5800COMBO is the industry's first professionally monitored, wireless, combination Smoke and Carbon Monoxide (CO) detector designed to help protect people and property. Using four sensing elements, the 5800COMBO provides true multi-threat detection and reacts fast to real danger while helping to reduce false alarms. A photo-electric chamber senses airborne smoke particulates while an electro-chemical sensor monitors the CO bi-product produced by slow smoldering fires. The Honeywell detector also features infrared (IR) flame sensing that measures ambient light levels and flame signatures, while thermal detection monitors temperature. Sophisticated and trusted algorithms interpret and respond to multiple inputs and provide the false alarm immunity expected in the most critical applications. Automatic drift compensation of Smoke and CO sensors accommodates for dust build-up over time. Additionaly, the reliable electro-chemical sensor has a 10-year lifespan. Our recommendations for mounting are based on physics, since CO is slightly lighter than air and when heated by a fuel-burning source, the lighter weight and warm temperature of the CO causes it to quickly rise to the ceiling and mix freely with the air. Check with the local Authority Having Jurisdiction (AHJ) for CO detector requirements in your area. Some recommendations for installing the 5800COMBO are as follows; On every floor of the facility, Inside any areas that contain a fuel-burning appliance, In the vicinity of flame-fueled appliances, but no closer than 10 feet. For wall mount installation place the detector should be at least as high as a light switch and at least six inches from the ceiling. For ceiling mount installation place the detector should be at least 12 inches from any wall. What is Carbon Monoxide and How Can it Harm Consumers? Carbon monoxide (CO) is an odorless, colorless, tasteless and highly toxic gas that is produced when fuels such as wood, gasoline, charcoal and oil are burned with insufficient air. The majority of residential and commercial fatalities caused from these fuels come from heating systems, engine powered tools and charcoal grills. Carbon monoxide is harmful when inhaled because it displaces oxygen in the blood and deprives the heart, brain and other vital organs of oxygen. Large amounts of CO can overcome a person in minutes without warning causing them to lose consciousness and suffocate. The 5800COMBO is designed to warn the end-user well before the CO reaches a fatal level. The detector's CO sensitivity is evaluated to UL 2034. INCREASED PROTECTION - The four sensing elements improve Smoke and CO detection, while also reducing the potential for false alarms. FAST AND EASY INSTALLATION - Provide dual capabilities in a single device reducing installation time and cost. A universal mounting plate enables direct mounting to drywall or common back boxes. LOUD AND CLEAR - Rely on crystal-clear audio alerts. The 5800COMBO has a built-in 85 dB piezo sounder with powerful alarm tones and a one inch, multi-language voice speaker. ALWAYS ON THE LOOKOUT - Be up to speed with device status and alerts. 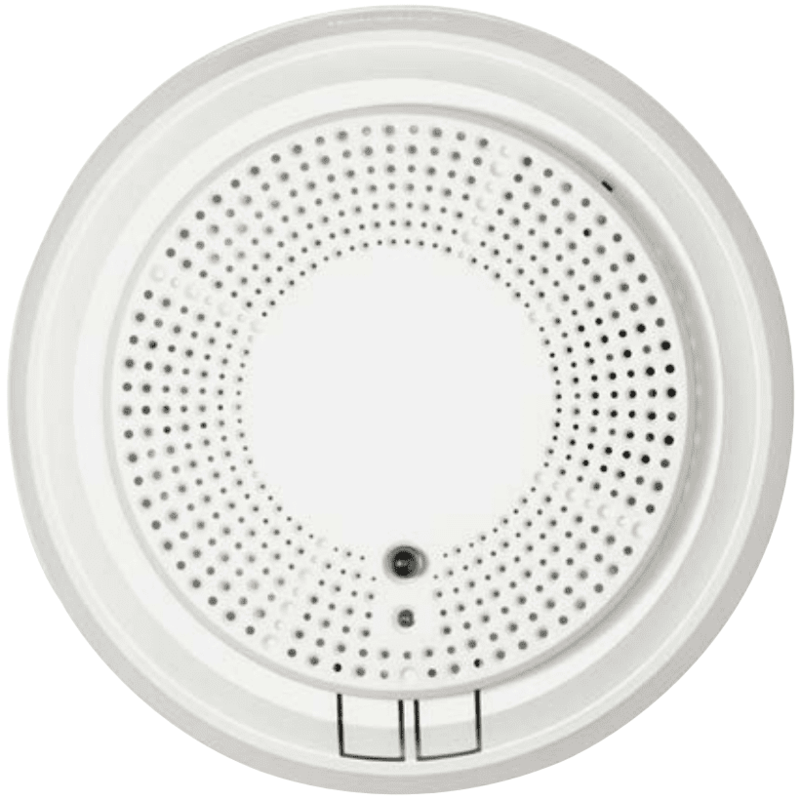 The 360° visual alarm with status LED enables status alerts and Smoke or CO detection. LONG-TERM PERFORMANCE - Benefit from years of reliable service. The 10-year electrochemical sensor life along with automatic drift compensation and smoothing algorithms features empower persistent performance.